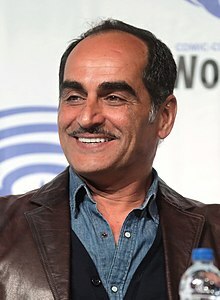 Navid Negahban (Persian: نوید نگهبان‎; born June 2, 1968) is an Iranian-American actor. He has appeared on 24, Homeland, Mistresses and currently plays the supervillain Amahl Farouk / Shadow King on the second season of FX's Legion. Negahban was born in Mashhad, Iran. He took a liking to theater when he was 8 years old while provoking laughter from a large audience by portraying an old man on stage. He left Iran when he was 20 for Turkey and then Germany, where he spent eight-and-a-half years. In Germany, he worked for a theater company, and then in 1993 he moved to the United States. He is fluent in English, German and Persian. He also began learning French for his role on Legion. He has appeared in The Shield, The West Wing, Lost, and CSI: Miami. He has collaborated twice with Iranian-American actress Necar Zadegan, once in 24, where her on-screen husband ordered his interrogation and the torturing of his family, and also in CSI: Miami, where, as his wife, she killed him. Negahban also had two collaborations with another Iranian-American actress Mozhan Marnò in the TV series The Unit and the movie The Stoning of Soraya M., where he plays the husband of Soraya (Marnò). In 2008, Negahban voiced and provided his likeness to the character Dr. Challus Mercer in the survival horror game Dead Space. Negahban also appeared as the main antagonist in the critically acclaimed TV series Homeland. In 2011 he won the Best Actor Award for the 2009 Iranian short film, Liberation at the Noor Iranian Film Festival, and in 2012, he returned to serve as an official festival judge. In February 2015, The Hollywood Reporter and Variety confirmed that Negahban had begun shooting the spy thriller, Damascus Cover, based on the novel by Howard Kaplan, alongside Jonathan Rhys Meyers, Olivia Thirlby and John Hurt. Negahban played the role of Syrian General Sarraj. Law & Order Imam Ibrahim Episode: "Fear America"
Law & Order: Special Victims Unit Dr. Rankesh Chanoor Episode: "Outsider"
2009 Fringe Dr. Malik Yusef Episode: "Fracture"
The Game Zane Kalim Episode: "I Love Luke...ahh!" Arrow Al-Owal Episode: "League of Assassins"
Person of Interest Ali Hasan Episode: "Panopticon"
2015 Scorpion Agent Khara Episode: "Forget Me Nots"
2017 Curb Your Enthusiasm Morsi Episode: "Never Wait for Seconds!" ^ a b c "Showtime Mini-Biography". Archived from the original on 25 September 2012. Retrieved 4 December 2012. ^ Ross, Matt. "In Depth: Navid Negahban". Rolling Stone. Retrieved 10 December 2012. ^ a b Laracy, Noah (2009-11-25). "Navid Negahban: A Back Stage Exclusive". Retrieved 10 December 2012. ^ a b "IMDb: Navid Negahban". Retrieved 10 December 2012. ^ "IMDb: Dishonor (2010) "Did You Know?"". Retrieved 10 December 2012. ^ "IMDb: "The Unit" (Security) 2006". Retrieved 10 December 2012.